Our beloved dad, grandpa, “great,” brother and friend went home to be with his Almighty Father in Heaven on Sept. 7, 2016. He said he was tired and wanted to be with his wife (Frances Cordova). He asked his daughters if that was OK with them, so with their approval and being at peace, that’s what he did. He was born March 10, 1933, in Chamisal, New Mexico, to Tranquilino and Sofia Cordova. 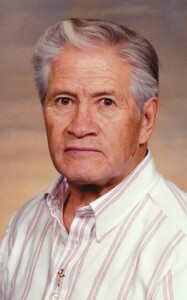 He married Frances Leyba in 1953 and 60 years later had to release her to our Lord. Three years later, they are reunited. Joe leaves behind his children Kathy Manzanares (Bobby), Randi Veronica Galvan (Dennis), Daniel F. Cordova (Gie), Annie Laurie Cordova and Ted Cordova; 12 grandchildren and 22 great-grandchildren. Surviving siblings are Ernest Cordova, Tranquilino Cordova, Connie Duran, Frances Armijo and Roy Cordova. Preceding him in death were his wife, Frances Cordova; daughter Susan; brothers Oracio, Benny, Abelino and Phil; and sisters Ida Cambron and Neva Marquez. Visitation at 6 p.m. and Rosary at 7 p.m. will be held on Tuesday, Sept. 13, and funeral services will be Wednesday, Sept. 14 at 11 a.m., both at St. Marguerite Catholic Church, 15 S. 7th Street, Tooele, Utah.